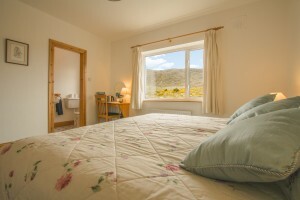 All our Rooms are elegantly simple in soft muted tones to reflect Sea/Sky and changing colours of the Connemara Countryside. Each Room is bright and airy with wonderful Mountain, Ocean or Island views. Double – 1 King Size Or 1 Double Bed. Twin – 2 Single Beds. Triple – 3 Single Beds Or (1 Double Bed + 1 Single Bed). Family – 4 Single Beds Or (1 Double Bed + 2 Single Beds). Children over 6 years old welcome. Begin your day with a light Continental Breakfast, Pancakes with Fruit, Chocolate and Maple Syrup, Fresh Fruit Plate or Scrambled Eggs with Bacon or Salmon. A Great Start To Any Day !! © 2019 Errisbeg Lodge B&B - Roundstone, Connemara, Co. Galway, Ireland. Phone: +353 95 35807.